Busy families sometimes have trouble fitting in three healthy meals each day. Snacking has become an important contributor to daily food intake. While children are eating extra calories, many still fall short on meeting their needs for vitamins and minerals, such as vitamin E, vitamin B6, zinc, and iron. 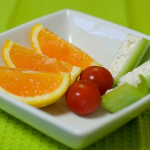 Whether eaten on the go or at home after school, healthy snacks are easy and quick to put together and eat, and offer important nutrients and energy. Keep healthy beverages, such as water, juice, and soymilk, and snack foods, such as the ones listed in the table below, on-hand at home and encourage your children to pack them into their bags before leaving the house.